I placed an order on my iPhone with the Amazon.com App on my way to work this morning. This action signifies a number “first’ moments: 1). this is the first time I’ve ever placed an order over a mobile platform. 2). this is the first time I’ve ever placed an order on an iPhone and 3). this is the first time I’ve ever placed an order over Amazon’s iPhone app. Prior to this, I’ve always felt there was something missing with the mobile commerce. Either the speed is too slow or the interface is not big enough for me, a very research-oriented shopper, to do my homework before placing a purchase. Back then, my mobile experience was limited to basic utilities (checking news, weather, stocks, directions, maps, score, etc…). With my recent acquisition of a 3G iPhone and the progress made by the app community, things are starting to cook for the mobile commerce. 3G Internet – Wireless data plan is a must for mCommerce to take off. Having 3G network more readily available across the coverage map will convince more people to do more transaction over their mobile device. As for me, I recently upgraded to an iPhone 3G. The data speed is consistent enough for me to be more involved with the apps downloaded from the iPhone store. It has turned my commute into a more productive session, reading up on emails, news, and social media sites without having to wait until I get to the office. (If only it can make me a cup of coffee too!). All said, the 3G data empowers me to shift more of my tasks towards an otherwise in efficient use of time. iPhone – the iPhone is just a marvelous device in doing the following task: receive information, extract the relevant parts and present it in a simple and powerful display. The concept is simple but no one (thus far) does it better than Apple. With the App store, Apple has given developers the power to expand on that concept and thus challenging the mobile community to take after that philosophy. The end result: consumers are the winners benefiting from some of the most powerful apps ever made, period! 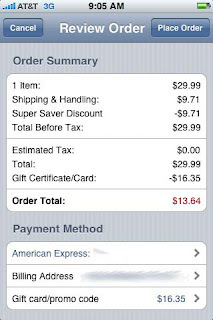 Amazon App – The Amazon iPhone application is a perfect segue from the last paragraph. These guys get eCommerce and they also understand how to build a solid mobile application. 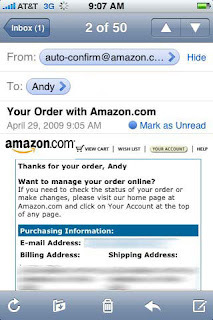 Utilizing iPhone’s UI, Amazon dev team created, in my opinion, one of the best mobile application. All the things we love about Amazon is here: product reviews, images, pricing, add to cart, save for later, move to cart, one-click checkout. It is so intuitive that I don’t feel like I have to have a desktop to do anything. My purchase was not an easy one. 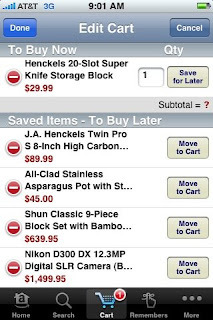 From prior desktop sessions, I had already added the Henckels Knife Block to my “Save for Later” cart. Amazon’s iPhone app was able to let me see that list and move it into the cart easily (much like the edit function in mail). I was also able to switch the payment type in the one-click checkout setting as well as choose the right shipping address from my contact book. Finally, I was even able to add in an e-certificate code to my order before checking out. All of this is taking place while I am on my morning bus ride into NYC. If you look at the time sequence on my screen shots, within minutes, I was able to receive an email confirmation on the my iPhone for my purchase. The only question I have for Amazon is: Where is your app for the Android? This is by far, the best mobile experience I have had. It was a flawless and smooth transaction and I can see myself shifting more transactions on my iPhone. Excellent job to Apple, Amazon and 3G mobile internet(AT&T).